The Stoneheaven Lodge, located in the Old Village of Mont-Tremblant, is the ideal place for unforgettable vacations! One of Tremblant's finest homes, this luxury home is the best, to enjoy a quiet vacation or a great getaway with friends! Available for Seasonal, monthly, yearly rental, the luxurious interior and the many amenities will enchance you! Well-located, it's an easy stroll to restaurants, shops, stores & pubs and, a five minutes drive to the ski hills or the one of the six world renowned golf courses! Shuttle service also available at 3 door steps ! - Cable TV, DVD player and wireless internet. THE LUXURY OF TREMBLANT, IT'S YOURS FOR THE TAKING! Amazing inground private hot tub with waterfall!!! 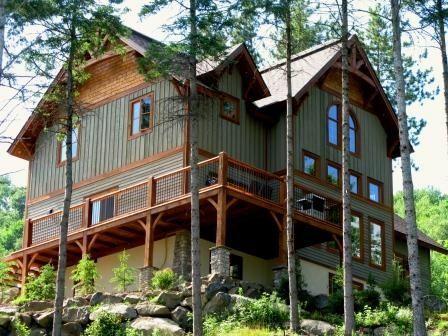 Five minutes from ski hills! In summer time : Share access and dock on Lake Moore. Amazing time with our family and very well equipped home - clean and well maintained! Had a wonderful time celebrating our 30th anniversary with our family. The home was a perfect fit for our family - large bedrooms and large family room and kitchen. Close to the skiing hills and shops and the hot tub was great at the end of the day! Thanks for the great accommodations - we made some amazing memories! A truly amazing place to stay !!! The group loved the lodge. It was our third annual getaway in Tremblant. A wonderful and very comfortable place. Awesome House- in a great location! This house was everything we were looking for in a great location. Stone haven served as home base for our yearly snowboarding trip and it did not disappoint. The location is central to both the old village and the base village of the mountain (5 min drive or 10 dollar cab ride). The house was super well equipped and the hot tub was an added plus. Overall I couldn’t recommend the property enough, Marc was great and super responsive. We will be back! Stunning chalet with wonderful amenities. We had an amazing time and can’t wait to come back again! Awesome house, great location. It is not very far from the base of Tremblant. The owner was very accommodating for our needs. I read some complaints about the driveway, it is not an issue. It snowed while we were there. It was sanded right away. If you can't get up the driveway there is a good sized parking place right at the bottom of the driveway. Great place, will go back again if we are back in the area. thanks! We had a great stay in this beautiful home. Comfortably fit 8 adults. Gorgeous views and a very quiet location. Convenient proximity to the Village, Casino and dining options. The driveway is a very steep, however, and really needs to have the snow/ice removed promptly. Several of our cars had issues with the state of the driveway. Host was very responsive and arranged for a plow within minutes of our contacting him.